As for Jupiter Ascending, it was/is a very divisive movie. I blogged about it and the very disparate reactions to the film back when it came out. Another interesting read. I don't think my reaction to the film was down to being male - my younger daughter watched it with me and didn't like it, either. We both thought it was a mish-mash that didn't work for us. Oh, there were certainly a lot of women who didn't like Jupiter Ascending as well as a few men who did. Meanwhile, I continue my episode by episode reviews of Star Trek Discovery with episode 2, "New Eden". I enjoyed Jupiter Ascending for the audacity of the scope and ideas. Where they lost me was in the third act with all the busy-work saving her family. It could have been just one favorite at risk. Then the owner of the galaxy goes back to cleaning toilets? Not happening, suspension of disbelief broken. Yup, going back to toilet cleaning was a bit strange. Not that there's anything wrong about being a cleaner, but it's usually not a job anybody does for the love of it. General Chuck Yeager can tweet faster than the speed of sound. My new pen name for my fantasy/paranormal books. It's more work, but much easier to target certain groups on social media. I continue my episode by episode reviews of Star Trek Discovery with "Point of Light". Does guesting on another author's blog count? Last week, I was interviewed as me; today, one of my characters is interviewd. It's Jack from The Elevator trilogy, a young man with issues. First time I've done a character interview - it was a great deal of fun. You forgot to post the link, Lorri. Meanwhile, I posted about a science fiction promo on StoryOrigins I'm part of and about the fact that one of my characters, Richard Blakemore, protagonist of the Silencer series who's also a writer, started his own blog. I didn't think we could post a link to our story. In case it gets deleted...white horse standing under trees (not pulling sleigh) book. Today I remember the Czech film director Vaclav Vorlicek who died yesterday aged 88. His films and TV shows were an important part of my childhood and when I couldn't find an English language obituary to link to, I decided to write my own. Delightful, Cora! Thank you for introducing me to this marvelous filmmaker!!! RIP, VV. A note that my novella releases in exactly three weeks! One writer's ongoing struggle with marketing, though he's showing some signs of improvement. You know, this was such cool research, I have to share. I participated in a paranormal investigation at the Queen Mary last weekend with Nick Groff from Paranormal Lockdown. I just wrote up a blog post about the experience. Best research I've done for a novel so far. It was for my supernatural romance which involves a TV show paranormal investigator and a skeptic tour guide at the place he is investigating. So, got some first hand experience investigating and even witnessed a seance in the most haunted room on the ship: B340. That sounds like a very cool experience, Tiffmeister. Meanwhile, I continue my episode by episode reviews of Star Trek Discovery with "An Obol for Charon". Leave a comment for a chance to win a paperback copy of Bound. Giveaway ends Feb. 14th. 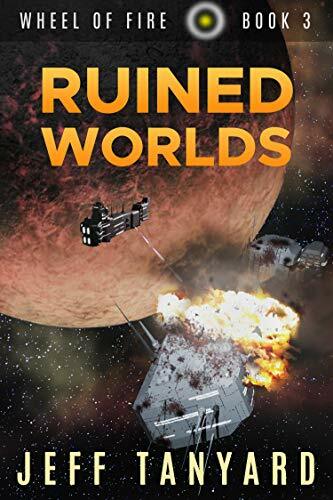 Ruined Worlds, Wheel of Fire #3, is now live! Cover Reveal for my upcoming novella Decision in Paris. I didn't tell y'all about this beforehand, and I hope you'll all forgive me for that. I'm sure some of you would have wanted to follow the results in real time. But I was afraid of jinxing it, so I kept it to myself. I had my first Bookbub yesterday. I was wondering why you've been so quiet lately. All that work! Whew! Wow! You had me biting my nails. I know - I picked it up from my daily deal email. When I was growing up, we'd occasionally find a box turtle in the backyard. I haven't seen a live one in many years, though. I miss them. Thanks for posting those photos, Vijaya. Neat stuff. Aw, thanks. I love these little turtles. I'm always rescuing them too... Jeff, I couldn't figure out how to post the picture on the "smile thread." I know I'm supposed to use the [img][img] button but when I click on the picture to copy and paste, nothing shows up. I upload a pic to imgur first. Then I use the link they give me for BBS/forums. But I think a photo has to be hosted somewhere off-site before you can post it here using the img tags. I think. Aha! I think I'm too lazy to make yet another account. Thanks Jeff. You don't have to make an account at Imgur. I don't have an account there. I just click the "new post" button and upload a pic. Then I hover the cursor over the upper-right corner of the pic to get the link list to show up. Then I copy the BBS/forum link and use it here. Once you do it a few times, you get in the habit, and then it goes pretty fast. That is indeed good news. Best wishes, D.M. I finished another novel last month! I've been blogging quite a lot recently, though I forgot to post in this thread. For example, I continued my Star Trek Discovery reviews with "The Sound of Thunder" and "Light and Shadow". I also shared my thoughts on the 2019 Academy Award winners. Finally, I also announced a new series and posted a free short story. I wrote a little something for British authors thinking about writing in American English.